We achieve this by employing excellent teachers and support staff that will provide support to pupils in both their academic and social development. We encourage pupils to develop and express their opinions in a constructive and positive manner. We are proud of our achievements and we are equally proud of the range of the extracurricular activities available to our students. This policy aims to outline the curriculum that we offer our students at Catcote Academy and the teaching & learning experiences. It is one, which caters for a wide range of diverse and complex needs. Catcote Academy is a special school educating students across a range of learning difficulties and special needs including ASD (Autistic Spectrum Disorder), SEMHD (Social, Emotional and Mental Health Difficulties), SLD (Severe Learning Difficulties), MLD (Moderate Learning Difficulties) and PMLD (Profound, Multiple Learning Difficulties) on two sites on the south west side of Hartlepool (Main site caters for Y7-11 learners and we also have a provision on Brierton Road that caters for our sixth form learners in Red and Blue pathway). Catcote Academy currently has on roll 151 students aged 11 to 19 years*. All students have a Educational Health Care plan (EHC). This policy aims to provide the basic teaching, learning and curriculum framework that we follow, however, for further information please also refer to subject policies, schemes of work, post 19 staff handbook and the school website. The curriculum provided includes the entire planned learning experience for students. It is informed by the statutory requirements of the National Curriculum, but also includes the range of extra-curricular activities that the school organises in order to enrich the experience of the students. It also includes the ‘hidden curriculum’, or what the students learn from the way they are treated and expected to behave (SMSC). We aim to teach students how to grow into successful learners, confident individuals and responsible citizens. Enjoy learning and are engaged. Make progress and reach their full potential. Will become as independent as possible. All the students in the school have special educational needs. As a school we have a curriculum that addresses these needs as well as the statutory requirements to provide access to the National Curriculum. At Catcote Academy we will follow NC POS (Programmes of Study) wherever possible however at Catcote this will mean that most students will follow modified POS and may use POS from earlier key stages. There are some students whereby it is stated within their one plan that the full range of NC subjects will not be followed due to personalised timetables and the need to address personal priority needs. At Catcote learners are grouped according to their needs and time allocation for teaching subjects varies dependent upon individual learners’ personalised timetable. Access to statutory subject requirements will be considered and specified in subject /area policy documents which will be reviewed annually. When planning curriculum programmes teaching staff at Catcote are asked to consider the following points. response to requirements of EHC Plans. Decisions made about the curriculum content for individuals at each key stage are continually reviewed and revised. Alterations are monitored and adjusted to ensure each individual has an appropriate and productive learning experience. In the following section we aim to provide a framework which sets out the opportunities provided within our school which meets the needs of all students. We have developed pathways to plan a curriculum based on the students needs and mapped out a progression route to adult hood. Students may move from one pathway to another as they progress or regress. Due to personalised curriculum some KS3 students may have some experiences of work related experience. Some areas of learning may be accredited which include Qualifications and Awards. In year 11 all students will gain an appropriate qualification in English, Maths, ICT and PSHE. The school offers accredited courses at Entry Level (which includes courses that cater for P Level learners) and Level 1 & 2 and GCSE. Information, advice and guidance is provided via the CIAG coordinator and external agencies e.g. local providers/IYSS coordinators/Social Workers. During EHC reviews a transition plan is put into place for each individual student, this could include organising vocational taster sessions, work placements, independent travel etc. Our sixth form students are given the opportunity to take a study programme, which reflects their prior attainment, education and life long outcomes. Our priority is the successful transition into adult life. Study academic, vocational and life skills qualifications. These qualification(s) are clearly linked to suitable progression opportunities, which support the student’s life long outcomes. Take part in meaningful non-qualification activity to support the student’s life outcomes, life skills and interests based on their identified needs. Continuation of English and Maths study (where appropriate progression to a level higher than that of their prior attainment). Meaningful work experience where appropriate. This may be related to any vocational areas of the study programme, which develops employability skills and/or creates potential employment options for those who cannot do substantial vocational qualifications. It may also include other activities unrelated to qualifications that develop the skills, attitudes and confidence that support preparation for adulthood. The curriculum is enriched in various forms; these include enrichment activities, which have been organised by subject leaders to enhance their curriculum. Evidence for these activities can be found on our school website, newsletters and portfolios such as SMSC. Students are grouped primarily according to their level of learning, additional needs (e.g. Communication needs, complex health needs, sensory needs, emotional, social and mental health needs) and preferred learning styles. Once the students have been grouped destinations are then considered to confirm the students are in the best pathway. The distribution of the curriculum varies depending on individual and class needs. A number of our students also have very personalised and individual timetables. Generally the class teacher largely delivers the whole curriculum. At Key Stage 3 for red and blue pathways a significant proportion of the curriculum is delivered by the pastoral teacher, apart some lessons that are delivered by specialist teachers (e.g. ICT, PE, Science, Music and Art). At Key stage 4 for red and blue pathways students stay with their pastoral teacher for at least PSHE and Life Skills and receive other lessons from subject specialists. At sixth form students in the red and blue pathways are taught predominantly by their pastoral teacher and have subject specialists for English and Maths, they spend two days following their chosen vocational pathway or on a work placement. In yellow pathway the students are taught by their class teacher through all key stages 3, 4 and 5, these classes adopt a topic/themed approach. Where appropriate we also use visits, visitors and Out of Hours Learning (residential, after school clubs, holiday projects etc) to support the curriculum. Many students at Catcote have ‘personal priority needs’ which are central to their learning and quality of life, for example the need to therapy and medical needs. It is essential these needs are planned for and met in order to enhance each individual’s readiness to learn, maintain physical well being, basic health, physical and emotional needs. The nature of this provision is described in student’s statements. At Catcote the nature and extent of support required for individuals is carefully considered as part of their programme of learning and input from other professionals is set out on an individual educational statements and regularly reviewed at annual reviews. The knowledge and expertise of parents and carers is essential and it is important parents and carers contribute to the students learning experience. Some students may need regular and continued help from specialists whilst for others; school staff may deliver a programme with guidance and supervision from a qualified professional. Many therapeutic activities play a complementary role in the curriculum and use of specialist environments such as water therapy or sensory room are written in individual student timetables. We always ensure these programmes of activity are planned and have appropriate objectives and targets for individual students. At Catcote we recognise the range of special educational needs experienced by our students and we endeavour to encourage our teaching staff to gain the experience and knowledge required to challenge their way of thinking and teaching for all learners. This will provide our students with transformative learning experiences and opportunities which are appropriate to their needs. The staff and students are involved in ongoing discussions and decision making processes so that the school curriculum can reflect and respond to changing priorities. Within Catcote we adopt a variety of teaching styles and methods to support the delivery of our curriculum. We are very aware that many of our students have their own preferred learning styles and that our students are ‘intelligent’ in different ways. As a school we ensure that we cater for these differences and support the student’s personalised programmes through a variety of teaching methods and styles. Programmes which we have invested heavily in are those such as TEEP ,TEACCH, SCERTS and THRIVE. This is a model of effective teaching and learning which has been drawn from available research and best practise. Staff may take into consideration the 6 stages of the TEEP cycle when planning work. The underpinning elements of TEEP (Accelerated Learning, Thinking for Learning, AfL, Collaborative Problem Solving & Effective use of ICT) are also heavily considered when planning work. We have trained a number of staff to work with students who have a diagnosis of Autism Spectrum Disorder. The TEACCH approach, through structured teaching, aims to overcome the difficulties people with autism have in understanding, predicting and controlling their environment. It promotes the development of a programme around a person’s skills, interests and needs which reduce stress and anxiety. It involves individual assessment, a visual approach, use of work systems and schedules and planned physical organisation of the classroom. For some learners this includes individual working areas where children can complete set tasks independently. We have specialist classes for learners with learning difficulties and ASD at both key stage 3 and 4/5. The SCERTS model is a research – based educational approach and multi-disciplinary framework that directly addresses the core challenges faced by children and persons with ASD and related disabilities, and their families. SCERTS focus on building competence in Social Communication, Emotional Regulation and Transactional Support as those highest priorities that must be addressed in any program. We currently have 9 licensed practioners and all staff are trained around this approach. The Thrive approach draws on recent advances in neuroscience, attachment theory and child development to provide a powerful way of working with children and young people that supports optimal social and emotional development. In particular, the Approach equips you to work in a targeted way with children and young people who have struggled with difficult life events to help them re-engage with life and learning. Specialised classrooms for individual students who require their own room. The Vestry, a community coffee shop located in Hartlepool Art Gallery. On entry to school prior attainment information is transferred to our school from their Primary school and are used to inform target setting. Other useful information such as Educational Psychologists’ test results and details of the student’s needs following their last annual EHC review, including any special requirements or medical information these are kept in the student’s SEN file for use by staff. We regularly moderate with our feeder schools and run a transition programme throughout the summer term. In their first half term at Catcote Academy new starters are given a baseline assessment and targets are then set for end of year achievements. Parents visit in Year 5 when they are deciding on a secondary school for their child. Y6 reviews take place in the autumn term and our SENCO and Student Family Support officer attends these. The children are invited to visit Catcote with parents. When admissions have been agreed, a period of transition begins; most children have the opportunity of coming for some lessons or activities on Friday afternoons. Some children may need a personalised programme of transition agreed between the new class teacher and feeder school. The majority of entrants are invited to events throughout the year and in the Summer Term start a series of sessions to become accustomed to the school. All students have a statutory Annual Review and in Year 9 this includes the writing of a Transition Plan. We are child centred at all reviews and in Year 9 have included a slideshow of photographs or video clips to start the meeting to support the students to present their interests and favourite activities. They can choose a piece of music to accompany this or talk about the photos as they are shown. From the review, we can start to plan ahead, taking the student’s views, hopes and interests into account and consulting with parents and other agencies. Statements are personalised and the provision is made to cater for each individual. During Year 9 the students will have vocational taster sessions to view potential courses that are on offer as part of the 14-19 curriculum. Early in the Summer Term they will choose their options for the vocational subjects. Throughout the programme students will access were appropriate work experience, work placements, and Careers Education that is personalised to their needs. Students will also access other areas of learning that support their personal priority needs. The majority of students elect to have extended education in at Catcote’s sixth form. Early in year 11 students are supported by our family student support officer, SENCo, pastoral staff and CIAG coordinator to create a transition plan detailed their chosen pathway. A transition programme begins in the summer term. A small number of students leave school at the end of Y11. Visits to the local and surrounding providers take place during the Autumn term and further discussion in the early spring term take place to support with college applications. Tasters sessions and a transition plan is then formulated and put in action where relevant for each students differing needs. In Catcote Academy have a distributed leadership model with our head teacher as a leader of leaders. We work towards building co-operative teams and effective partnerships with professionals and parents. Staff with a leadership role will seek to develop an organisational culture dedicated to providing high aspirational and appropriate teaching and learning, which addresses the needs of all our students. TLRs/Subject Leaders must ensure that targets for improvement in the Curriculum Area are set and met, through positive approaches to curriculum development, the planning and preparation of schemes of work, the monitoring of learning and teaching across the Curriculum Area and the support and development of staff. TLRs/Subject Leaders need to have a good knowledge of educational issues and are expected to keep up to date with and lead on improving pedagogy and practice where it is relevant to their curriculum area. Staff who are responsible for a subject are expected to annually evaluate their area using their Departmental Development Plans (DDPs). These DDPs evaluations in turn support the whole school SEF strengthening the judgements that have been made. In addition to this staff are also expected to review and amend policies on a yearly basis. Subject Leaders are responsible for the monitoring of their subject, which includes quality assurance via observations, learner walks, analysis of data, moderation of work and scrutiny of work. Please also refer to Assessment Policy, which includes detailed information on our monitoring processes. Planned observations are recorded on a ‘Teaching & Learning’ database, which stores data on areas of strengths and areas for development. This data enables SLT to analyse teacher performance across the school. Staff collaboratively plan their teaching in coaching partnerships and may carry out peer observations to review and develop their pedagogy and evaluate the effectiveness of the teaching and learning. Our local governing body is responsible for monitoring the way the school’s curriculum is implemented. There are calendared meetings on the school self evaluation calendar of when they meet. Within subject policies teachers have given a long term overview of topics/units being taught across the year or years (long term planning). All teachers are expected to use the schools Scheme of Work Template to plan units of work (medium term planning). Where appropriate staff are asked to give an overview of each session detailing an outline of activities. Examples of differentiated objectives and outcomes are highlighted but these are detailed further within lesson plans (short term planning). Targets are set using prior attainment with reference to national data within CASPA. Targets are tracked throughout the year by TLRs and SLT. Teachers and Core TLRs also moderate baselines. The TLRs are responsible for analysing data, then planning and implementing any intervention that is needed. Teachers make judgements when reviewing a range of evidence both in daily lessons and over a period of time. These judgements are assessed against the targets on the assessment record sheets. 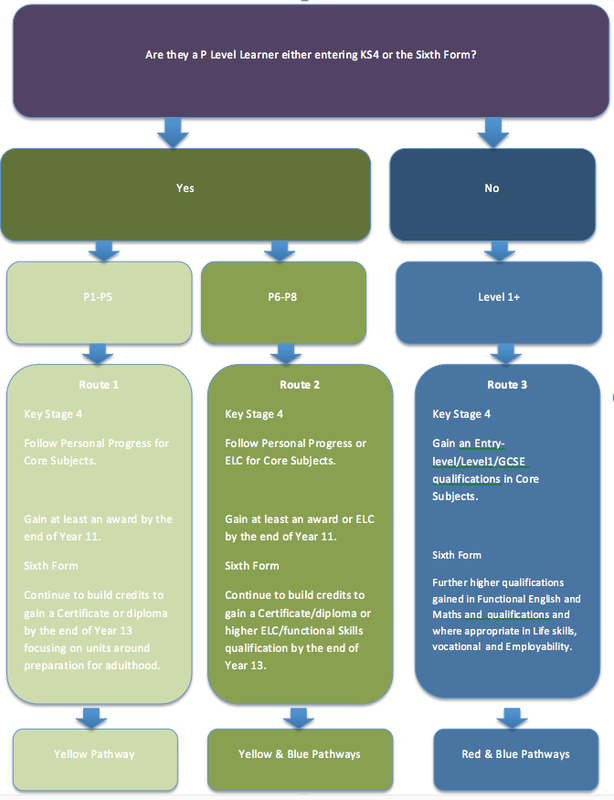 Using Connecting Steps, the school has an agreed system of recording stages towards mastery of a skill (see Assessment Policy for breakdown of stages). Connecting Steps calculates percentages of levels to show progress. This data is analysed to improve standards and the quality of teaching and learning. To support teacher’s judgements the school moderates work every term (levels and accredited work). By cross moderating work we can ensure that the judgments being made are reliable and accurate. Exemplar work which has been selected through this process is used to compile subject ‘standard files’. Each term staff carry out scrutiny of work on a selection of students to quality assure teaching and learning across the school through progress meetings. TLRs are also involved in learner walks. Outcome plan targets are written annually and targets are reviewed termly (taken from EHC Plans). These reflect the student’s individual learning programme including personal achievement. The school offers the curriculum equally to all students regardless of gender, cultural background, race or religion. With the modified and personalised curriculum that we offer we are able to provide all students equal access to the curriculum regardless of their learning difficulties, language difficulties, medical or physical difficulties or social attitudes. This policy is a working document and is amended in relation to the changing population of the school.